The free forum has been designed as a platform for Analytics professionals to share analytics knowledge and experience while also providing a chance to keep up with Analytics technologies advancements. Its a great chance to network with some knowledgeable people. 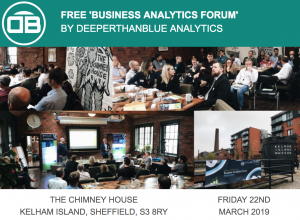 The forum aims to be run three times a year, with guest speakers from a range of Analytics solution providers, alongside presentations from forum members themselves. When & where was the forum? 11:00 – WELCOME with refreshments of tea, coffee & a wide range of herbal teas along with biscuits for dipping! 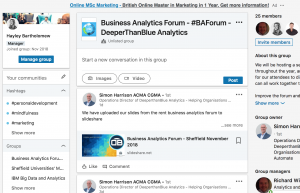 We explained that we wanted to provide in a forum; where people could come along and find out how analytics can be used to add value to their business. The forum aim is to be an excellent networking and knowledge sharing opportunity, with meetings every four months, including featuring guest speakers, industry experts and hands on sessions. Chris Booker, DeeperThanBlue’s Sales & Marketing Director, explained who DeeperThanBlue are and introduced Simon and Richard, from DeeperThanBlue Analytics. “How Happy is London”, “How technology had been used to help improve flood management” and “How technology is being used to help dementia sufferers”. For the practical section, Simon and Richard chose a topic that showed a broad range of uses of analytics within a business. Simon and Richard explained how they had taken a case study of a Sheffield based manufacturing company, that had not used analytics before, and used the data to breakdown the company into the key drivers that deliver profitability. This was Sales, Purchasing and Direct Labour. They presented an overview of how to use predictive analytics to plan for sales, and set the strategy, with customer analytics to minimise risk and ensure the right customers get the right level of nurture. Economics forecasts were introduced by sector and used to help keep the strategy in check. Once the sales plans were defined, they went on to show how the Purchasing, Production and Labour plans could be set to allow performance to be measured against the strategy. The ability to link the plans together was discussed, and how the team recommend using IBM Planning Analytics for this and why. There was a Q&A session, which brought out some great questions from the audience including ‘How can we use weather to predict performance?’ and “How to strip out the effects of weather to allow a proper underlying base case to be set’. – How can cognitive technologies be used to improve analytics? 13:00 -COMPLIMENTARY BAR including Kelham Island Brewery beer, selection of white and red wine, plus soft drinks with a BUFFET LUNCH of ‘Yorkshire Nibbles’ which is all freshly made and locally sourced – it was delicious! Please click here to view the powerpoint presentation slides from Simon & Richard. We hope to see you at the next forum! Please click here to register and for more information. Please also follow our social media pages to keep up to date – handles at the bottom of this page. Simon & Hayley from DeeperThanBlue Analytics. There’s a saying doing the rounds at the moment that, Data is the new oil and Analytics the new engine.